When Persona 4 Dancing All Night was announced back in 2015, I was so excited. That excitement led me to buy it in Japanese right when it came out because I was worried if we’d see a localisation announcement and while I couldn’t understand the story parts much as I was a total beginner at Japanese at the time, I played all of the songs and unlocked everything enough to get the Platinum trophy, despite pretty much not knowing any of its story and just enjoy its dancing fun in the Vita version. With the recent Endless Night collection including the Persona Dance games for Persona 3, 4 and 5, this seemed like the perfect opportunity to get to know the wonderful remixes of the songs I loved from Persona 4 and the Vita version all over again while finally getting to know its story too and after spending almost 15 hours with it, I’m glad I did. The twist on Persona 4’s world and story with an Idol mystery was a great way to see the charming characters from the original paired with some new favourites, and seeing the high quality visuals on PS4 with snappy load times and sharp visuals in its rhythm game moments made the quality of this Persona Dance game feel not far behind the newer releases. If you’re looking to experience a different mystery with the Investigation Team alongside fun new characters and involved dance mechanics that feel just as good as its more recent editions, Persona 4 Dancing All Night is well worth it for fans of Persona 4 and rhythm games, and with it being such good value in the Endless Night collection on PS4, it’s an experience that Persona fans who like more story mixed in with their rhythm mechanics can enjoy experiencing in its best form yet. 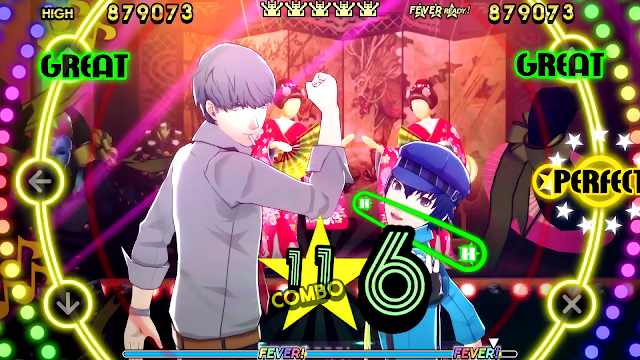 As the first game in this series of Persona Dance games, Persona 4 Dancing All Night works hard on giving a solid reason why the popular JRPG Investigation Team from Persona 4 are suddenly dancing in its mostly visual novel-style story mode. Dancing All Night is centred around a rumour, much like its source material, with this one revolving around a website. The rumour states that if you look at a certain website at midnight that you can see an Idol dancing and those who watch it to the end are said to get taken to another world. As Yu and his friends prepare to help Rise with her upcoming comeback, another Idol group goes missing, so with their Personas and new dance skills, it’s up to them to dance their way to the truth while they try to search for the girls and get to the bottom of the rumour and its effect on the city. Yu, Rise and the Investigation Team Persona 4 players know are front and centre in Dancing All Night as they should be, but some of the newer or lesser known characters introduced in Dancing All Night may be familiar at least by name to those who have played Persona 4 and serve as giving as more insight into Rise’s world. Rise’s agent Inoue is featured quite a bit, along with Rise’s rival Kanami Mashita and her group Kanamin Kitchen, with Kanami now being a proper character and taking on a lead role in this story. These newly developed characters are some of the highlights of the story, particularly with Kanami’s charming personality stealing the show in many scenes and she works well as a fun character while also having a kind and caring side that works nicely in her many moments with Nanako and the others and is a great example of the effort put into fleshing out these roles that were merely names Rise mentioned in Persona 4. The Investigation Team shines brightly in this story too, with their friendly banter brightening up the darker moments but showing growth as they’re a little older, so in the end the whole cast felt very likable in the story as its twists and turns played out and gave me many moments that reminded me why I like them so much in the first place. As for the story itself, I enjoyed watching everything play out and was genuinely surprised by some of its twists, despite the fact that the use of a timeline to tell it all made it less straightforward then it could’ve been. Particularly in the first few chapters the narrative started to jump around a little - first you’re at Yu’s side of the story, then you jump back in time to Rise’s and then to Kanami’s with random songs in between and while there were always reasons for the jumping with characters being in different places or giving different perspectives, it sometimes felt a little unnecessary and I think would’ve felt smoother if it was done a bit more consecutively. In saying that, it’s not a deal breaker for me at all though as I thought the plot was really interesting. One of the main things I liked about Persona 4 was the gradual and sneaky way its mysteries unfold and Dancing All Night had that kind of unraveling effect that made everything feel connected at the big reveal, so despite its somewhat tangled flow I liked the story a lot and with great characters to enrich its mystery and keep it fun, all the jumping back in forth in the story and all the perspectives it gave felt like they joined together in the end to make another great mystery. Despite its lengthy story, one of the main features of Persona 4 Dancing All Night is its rhythm game that is featured briefly in Story Mode and has a dedicated Free Dance mode where you can dance your heart out to the fantastic Persona 4 soundtrack as well. 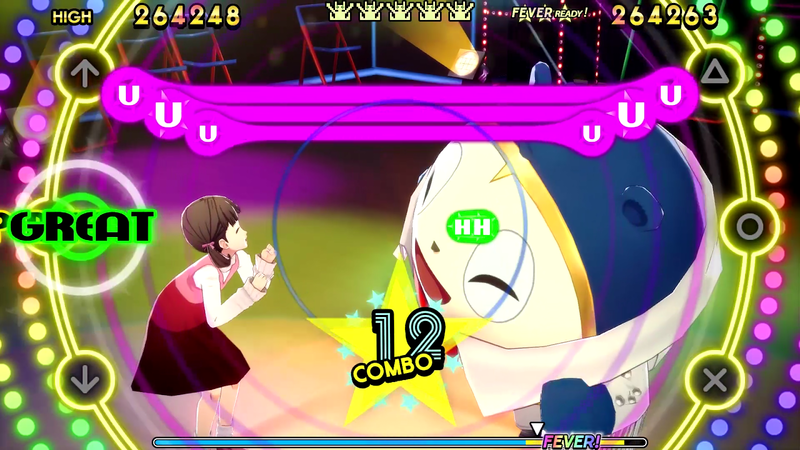 If you’ve seen the newer Persona Dance games, Persona 4 Dancing All Night is basically the same system just with your hype meter in a different spot. As notes come out from the middle of the screen, once they get in the circles you hit the corresponding buttons on the controller, with linked notes that have you hit two notes at once, scratch notes you hit with the analog stick and varying levels and challenges and difficulty modes keeping things feel interesting and involved. Compared to the newer games, things felt for the most part just as smooth. Notes being hit respond quickly as they should and the similar U.I. is vibrant and easy to see and although I got a few “Not Cleared” results when I first started because I’d forgotten some of the songs, once I got my rhythm and used to keeping that Hype gauge above green I had a lot of fun replaying my favourite tracks. If you don’t mind its scoring system that goes more on consistency rather than your overall performance, playing this game on PS4 and on a big TV feels great and is so similar to the other two gameplay-wise you can easily pick up the system if you’ve played any of them before. Speaking of the PS4 version, the reason I was prompted to get Persona 4 Dancing All Night on it was thanks to its inclusion in the Endless Night collection of the Persona 3 and 5 Dance games and it’s currently the only way to get it for PS4. It is still available for PS Vita as well, but depending where you are it may not be discounted, so at the moment the collection seems to also be the cheapest way to get it in general. As for the newer version, considering it hasn’t been made clear if anything’s been done to bring it over, it’s a pretty good port. Load times seemed very snappy both between songs and story scenes with it only stopping to save my game and while in animated scenes, some pixelation is sometimes noticeable because it hasn’t been optimised for the bigger screen, but in the rhythm game portion the high quality models of the Persona 4 characters look pretty close in quality to the ones in the newer games. I couldn’t find anything directly saying that the PS4 version has been visually updated, but I did put the Vita game into my PS Vita TV for comparison and I swear I felt a difference in overall smoothness, from button response to visuals. Perhaps this is just because the game is running on more powerful hardware, but regardless the PS4 version definitely feels like the best way to play and since rhythm games rely a lot on smoothness to have the best chance of getting all the notes, I would recommend that version if you can afford the bundle. 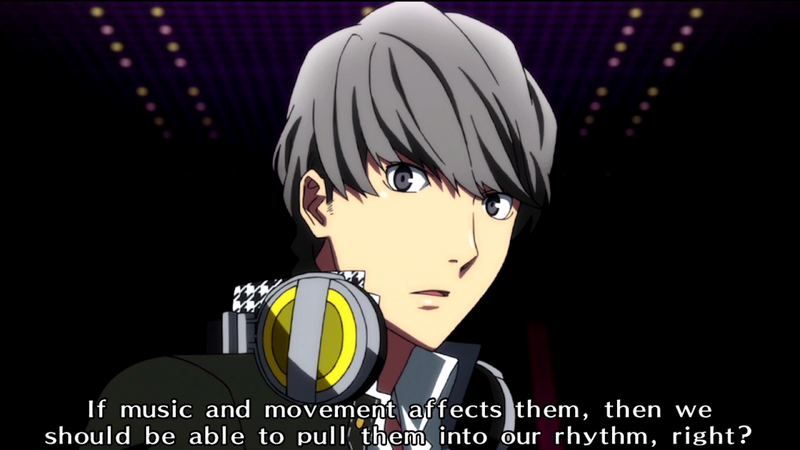 When I wrote my impressions of Persona 4 Dancing All Night years ago, I said it was an absolute treat for fans of Persona and rhythm games and after playing through its story and being able to say I’ve experienced it in full, I can say I feel this even more strongly now. I adored its fun newer characters in its mystery and with how good the rhythm game feels on PS4, it’s nice to feel like the already great mechanics from this original version of the Persona Dance games is up to scratch with the new ones too. While the newer Persona Dance games are more focused on the rhythm game, if you can get past the jumpy timeline, Persona 4 Dancing All Night has an interesting story to tell with well-developed characters alongside the rhythm mechanics that spawned this spin-off series, and as a fan of rhythm games and Persona 4, I’m happy I came back to it in this smooth form and can’t wait to play to its great soundtrack again soon. 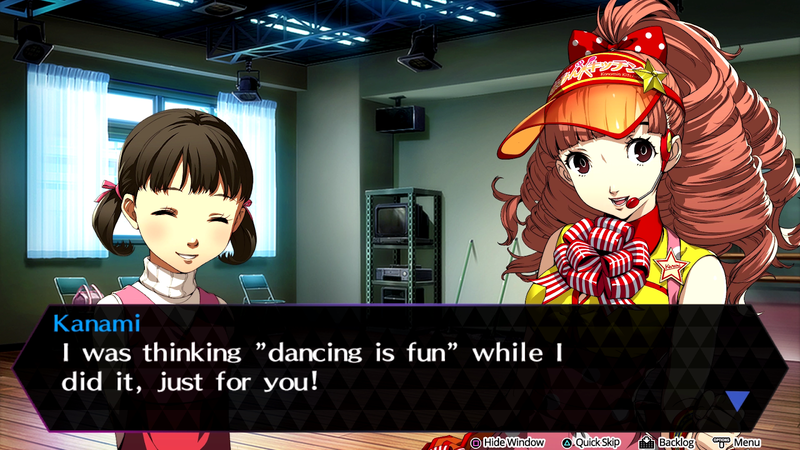 Have you tried Persona 4 Dancing All Night or any of the other Persona Dance games? How do you feel about them?